GLEN DALE, W.Va. – Last year, the growing network of cancer centers across the WVU Medicine system added the WVU Cancer Institute operated by WVU Medicine Reynolds Memorial Hospital in Glen Dale. 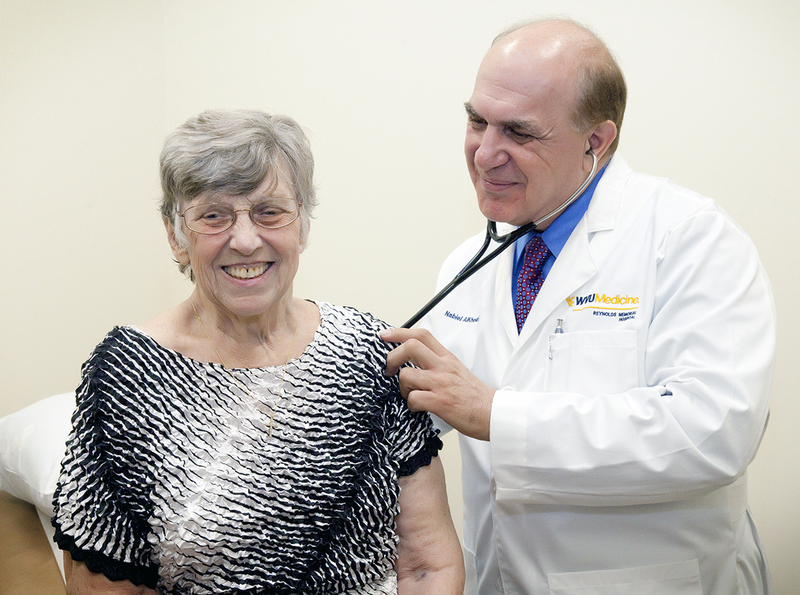 Nabiel AlKhouri, M.D., examines Kathryn Renshaw, one of the first patients at the WVU Cancer Institute in Glen Dale. The 3,606 square-foot facility is conveniently located next to the hospital. The medical oncology and hematology clinic is staffed by Nabiel AlKhouri, M.D., a full-time WVU Cancer Institute physician. Dr. AlKhouri is supported by an experienced team of nurses, therapists, social workers, and other clinical staff from Reynolds Memorial. He sees any diagnosis of oncology and hematology patient. The WVU Cancer Institute in Glen Dale includes a five-chair infusion room, two private infusion rooms, and two patient exam rooms. Infusion treatments include chemotherapy, biotherapy, monoclonal antibodies, immunotherapy, hormonal therapy, therapeutic phlebotomy, vitamin therapy, and more. The WVU Cancer Institute in Glen Dale also provides supportive care for patients undergoing chemotherapy, which includes IV hydration, electrolyte replacements, and growth factors. The WVU Cancer Institute at Reynolds Memorial Hospital is open 8 a.m. to 4:30 p.m. Monday through Friday. To make an appointment, call 304-843-3302.